Everyone has their favorite cult hero of the Cricket World Cup. It’s what sets the tournament apart from all other one-day cricket; have a day out in a far-flung bilateral series and you might become a momentary hero, do it in a World Cup and you’ll live forever. Gus Gilmour, Neil Johnson, Collis King, Eddo Brandes, Winston Davis, John Davison, Dwayne Leverock, Steve Tikolo, Nolan Clarke, Dave Houghton all probably did plenty that was good, but it was their World Cup heroics that keep them at the tip of the tongue for cricket lovers. For every heroic deed like theirs though, there’s a host of other players whose names evoke warmth despite largely anonymous showings. To those of us enthralled by the 1992 edition, names like Willie Watson, Meryck Pringle, Iqbal Sikander and John Traicos mean far more than they really should. Perhaps then the concept that an international tournament like the World Cup is as much about the joy of participation as it is about winning is something we should remember. On that note and in the continued interests of this blog presenting opinion as fact, when it comes to cult figures of the World Cup it’s hard to overlook 1987 Australian Paceman Andris Karlis ‘Andrew’ Zesers, whose name alone made him a little hard to ignore. Like Graeme Porter eight years earlier, Zesers turned out for his country for the first and final times during the group stages a single World Cup campaign on foreign shores, going wicketless on debut in a loss to India and taking John Wright’s wicket in Australia’s 17-run win over New Zealand. In truth his backstory is much more interesting than his actual World Cup deeds. Picked as a 17-year-old for South Australia, the son of a Latvian-born construction worker had been the youngest Australian bowler to reach 100 first class wickets but two years after playing his modest role in Australia’s World Cup triumph, a shoulder injury had prematurely ended his career at 23. 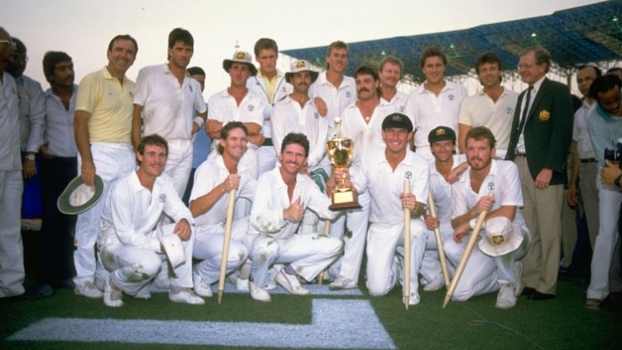 Every time I look at the photo of the jubilant Australians celebrating their final win – Zesers grinning away anonymously behind Steve Waugh – I can’t help but smile. Was he any good? I don’t even think it matters.